Ensure you are mobile enough to perform the exercise you are about to do. Most gym injuries occur because the movements required to perform the exercise cannot be done properly in isolation, so you take a dysfunctional movement that is then loaded up with weight which forces the body to compensate. The result is a nice combination of strains, sprains or even worse. position with your knees straight before you perform the deadlift. By doing this it means that you have the hip and lower back mobility to safely get into the starting dead lift position. For a squat, ankle mobility is important so make sure you can bring your knee over your toes at least 10cm. You can do a knee to wall test and see how far your toes are from the wall. Having this good motion at the ankle means that the body stays better aligned throughout the squat movement and weight is distributed well through the feet. Thinking about the muscles you are training recruits more muscle fibres which means your muscle contraction will be better and the quality of your workout higher. What you can do is try to hold and squeeze the target muscle for 5 seconds before doing the set. For example, if you want to activate the latissimus dorsi muscle you can have your arm down by your side and squeeze your arm into the side of your body so that your thumb pushes against your thigh. If you find that thinking alone doesn’t seem to make your muscle contract you can use a technique called ‘feathering’ which is lightly touching the skin overlying the muscle. This creates more sensory input into the area allowing the neural connection from the brain to the body to be made. While you perform the exercise really imagine the muscle contracting and relaxing. This is done best with a lighter weight first. So, do a light weight set of 15-20 reps really activating the muscle before moving to heavier weight. Stop and reset after each rep. After you’ve finished the movement of the rep hold in a switched off position for a second to reset after you’ve just completed the rep and rethink about the movement you’re about to perform and the muscles involved again. 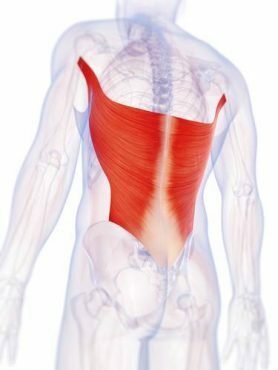 A common thing to see in gyms now is an increased lumbar curve or lordosis. The common name for this is a sway back and is often happening with a squat where during the down phase the bum is really exaggerated to stick out. Social media has been a big influence on this as the perception is that this is the way to get a nice back side when really the lower back is placed in an extreme range of motion and further forced into extension by adding the barbell on top. This is a Chiropractor’s nightmare to see, don’t do it! What you need to do is keep the spine in a neutral position throughout most exercises. This means to maintain the natural lower back curve. By doing this, weight is distributed evenly throughout the discs and the joints of the spine and in this position the hips can move and muscles activate optimally. To find our neutral spine you need to find your extremes of movement of the pelvis. In the standing position, place your hands on top of your hips and bend your knees slightly rolling your pelvis forward, this is anterior tilt. Now do the opposite and bring your pelvis back, tucking your tail bone, this is posterior tilt. Your neutral spine is half way between these two points and will be slightly different for everyone. For more advice on injury prevention, treatment and management contact chiropractor Dr Campbell Allport at Melbourne Natural Medicine Clinic.